Omron has introduced a new adapter through which all the CP1 series PLC can be connected in Ethernet network as slaves.Earlier there was no option of Ethernet communication in the micro plc of omrom. But with the introduction of the CP1W-EI01 connector CP1 series plc can now have Ethernet/ip communication. With this new function the micro plc of Omron can now be in Ethernet network and behave as intelligent slave devices for monitoring and control. The CP1W-EIP01 connector easily mounts on the unused slot of the CP1 series PLC. We have already discussed about the CP1W-CIF11 connector which is used for Modbus Communication.With the help of this connector CP1 Micro Plc can be turned in to an intelligent Ethernet slave device. The PLC must be connected to a Ethernet master device for the data sharing purpose. Each PLC connected with EIP01 can be used for data monitoring and control over the Ethernet network. Also Micro PLC have transistor type outputs and thus can be used for the motion control purpose also and also has real time clock. 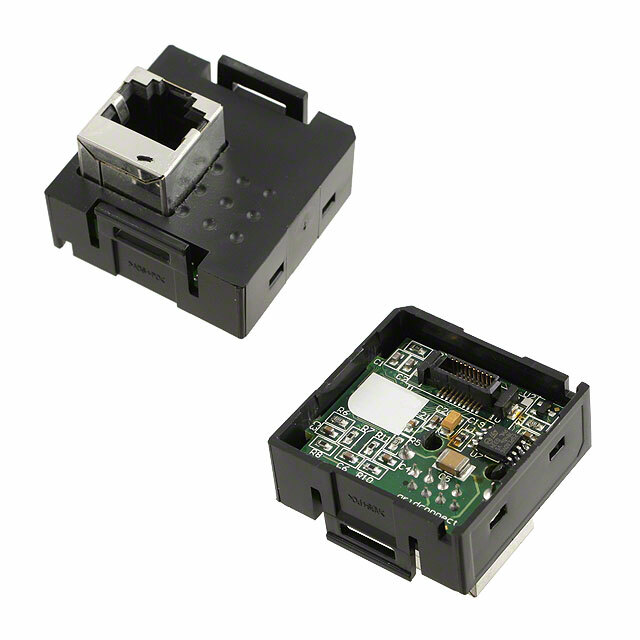 Also this connector is ControlLogix and CompactLogix compatible and can be connected with these devices. So the Omron CP1 series PLC with CP1W-EIP01 can be connected to Rockwell Ethernet/IP Master. Also up to 128 slave device can be connected in one network with one Master. The distance between the HUB and the CP1W-EIP01 can be up to maximum 100m. This Ethernet/Ip connector is of 100Base-Tx type and can also be converted to 10Base-T.
For setting up the CP1W-EIP01 for Ethernet communication first of all we have to put its IP address. The Default IP address of this connector is 192.168.250.11 and we can put any address that we want. The IP address of the slave device has to be defined in the Data Words (DM) of PLC. The IP address which needs to be set is put in D1200 and D1201. In the D1200 the first and second octet will be defined (in HEX) and in D1201 third and fourth octet. The request packet interval time is 10 ms minimum. Now let us discuss about a application where this Ethernet Connector can be used efficiently. See the below system configuration. In this system Omron CJ PLC is used as Master , connected with Omron CP1H plc as slave. The CP1W-EIP01 is mounted on CP1H plc and is acting as slave in the network. 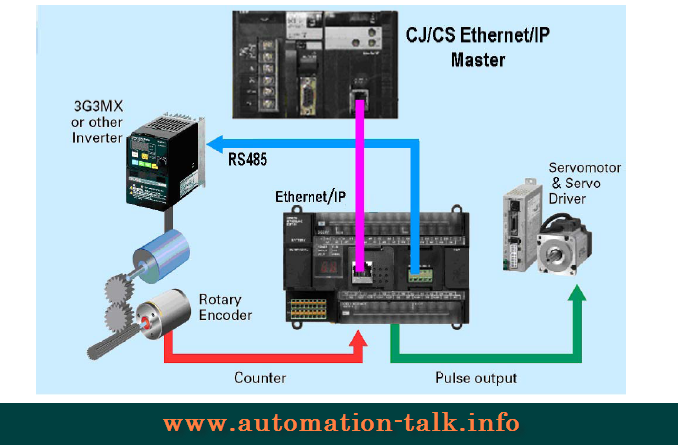 Now this PLC is communicating to CJ plc in Ethernet network and the CP1H plc can control a VFD through MODBUS and also can control a servo drive by using Pulse type outputs. Also it can accept the High Speed Input of Encoder. We have already discussed about the How to run VFD in Modbus through Omron PLC , PLC Program/Connection for Omron Servo Drive and Omron Encoder Connection with PLC and its programming. So this Ethernet/IP connector is very useful where we need to have Ethernet Network and can provide a cost efficient solution. If you have any doubts you can write to us in the comment section. Also you can subscribe to get all latest updates by E-Mail.